Automatic Hinged and Swing gates are designed to provide a high degree of security, controlling access for vehicles in applications such as factories and commercial premises, banks, embassies, warehouses and distribution centres, hospitals, airports and transport terminals. Frontier-Pitts' gates are available in a wide range of styles to complement both contemporary and traditional architectural designs. They can also be custom-designed to match a company's specific requirements. Compliant to BS EN 13849. Manual Hinged and Swing Gates also available. LPS 1175 Forcible Attack Automatic Bi-folding Gates and Hinged Gates from the Platinum range now available. 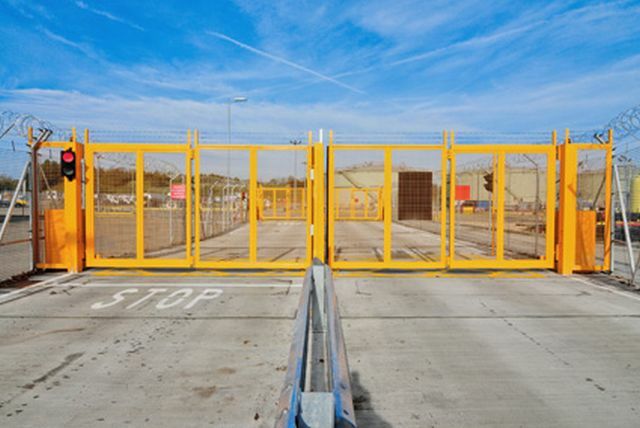 Fast acting bi-folding gate providing a high level of security. Electro-mechanical overhead drive, Tracked and Trackless models are available. Fast acting automatic bi-folding gate providing a high level of security. Electro-mechanical or hydraulic, Tracked models only. Has successfully resisted forcible attack to LPS 1175 Security Rating 2 and 3. Red book listed. Hinged and Swing Gates are designed to provide a high degree of security within a fence line where the runback required for a sliding gate installation is not available. Automatic hinged/swing gate providing a high level of security. Has successfully resisted forcible attack to LPS 1175 Security Rating 2 and 3. Red book listed. Shotblasted, hot zinc sprayed, primed and finished with a final coat of polyurethane paint to a BS or RAL number. This process provides a 20-year corrosion protection system for exterior, industrial polluted inland sites to BS 5493. Automatic Bi-folding: Drive dependent, Contact manufacturer for details. Automatic Hinged: Contact manufacturer for details. Hinged: 2400/ 5000 mm (standard/ maximum). Platinum Bi-folding: SR2 - 2000/4500 mm (standard/maximum) SR3 - 2400/4500 mm (standard/maximum). Platinum Hinged: SR2 - 2000/4500 mm (standard/maximum)SR3 - 2400/4500 mm (standard/maximum). Bi-folding Speed Gate: Available up to 10 000 mm. Hinged: Available up to 10 000 mm. Platinum Bi-folding: Available up to 10,000 mm. Platinum Hinged: Available up to 10,000 mm. The product information below is from the NBS Plus library of product clauses offered in NBS specification products. It has been created by NBS for Frontier Pitts Ltd. Each product clause is authored in NBS format and is intended for inclusion in project specifications. Please note that NBS product guidance is not a replacement for the manufacturer's literature and it is recommended that Frontier Pitts Ltd be consulted before specifying. To prevent the gate closing on a person or vehicle.